What did the Duke of Wellington think of Louis XVIII? Louis XVIII climbing the mât de cocagne by George Cruikshank, 1815. 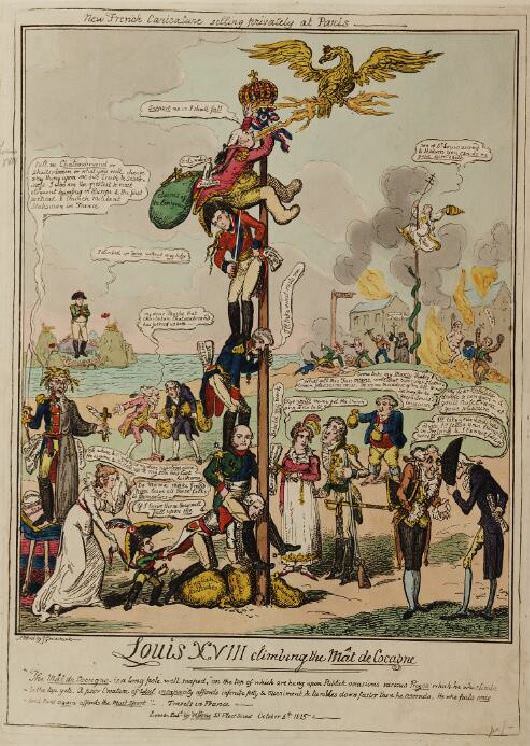 “The Mât de Cocagne is a long pole, well soaped, on the top of which are hung upon Publick occasions various prizes which he who climbs to the top gets.” Louis XVIII is propped up by the Duke of Wellington and his sword. Though Arthur Wellesley, the first Duke of Wellington, is usually associated with Napoleon Bonaparte, he had an equally large impact on Napoleon’s successor, King Louis XVIII. It was thanks to Wellington’s and Prussian Field Marshal von Blücher’s victory over Napoleon at the Battle of Waterloo in 1815 that Louis XVIII, a member of the House of Bourbon, regained the throne of France. While Louis had a pronounced fondness for the British field marshal, Wellington thought rather less of the French king. The Duke of Wellington played a role in Louis XVIII’s fate even before the Battle of Waterloo. The Duke’s victory in the Peninsular War contributed to Napoleon’s first abdication of the French throne in April 1814. As a result, Louis XVIII became king of France. During the First Restoration, Wellington served as Britain’s ambassador in Paris. For the embassy, he purchased the Hôtel de Charost from Napoleon’s sister Pauline. Before he was called away to be the British representative at the Congress of Vienna, Wellington had many encounters with the royal family. He hunted with them, and attended dinners, concerts, plays and other gatherings frequented by Louis and his court. After Napoleon escaped from Elba and returned to France in March 1815, Wellington hurried to Belgium to play his famous role in the Emperor’s final defeat. Emerging victorious at Waterloo, Wellington urged Louis XVIII to return quickly to Paris. The King’s restoration to the throne was by no means guaranteed, and Wellington considered it essential for France’s stability. At his headquarters in Neuilly, Wellington conducted negotiations for the King’s return and the formation of a new government before the other allied leaders could arrive. The King sent for the Duke and me, this evening, to the Tuileries…. We found him in a state of great emotion and exultation at the reception he had met with from his subjects…. Indeed, during the long audience to which we were admitted, it was almost impossible to converse, so loud were the shouts of the people in the Tuileries gardens, which were full of people, though it was then dark. During the Second Restoration, the Duke of Wellington served as commander-in-chief of the allied occupation army, which remained in France until 1818. He deepened his acquaintance with royal family during this period, and helped Louis solidify his reign. The King expressed his gratitude by presenting Wellington with a 102-piece dinner service of Sèvres porcelain, and the comment: “Do little gifts – keep friendship alive.” (5) The china, originally commissioned for Napoleon’s wife Josephine and decorated with images of Napoleon’s Egyptian campaign, can be seen at the Duke’s residence of Apsley House in London. Louis also made Wellington a Knight of the Order of St. Esprit. Wellington wears the badge in Napoleon in America. Among other things, Wellington admired Charles’ stamina and skill at hunting. What did Napoleon say about the Battle of Waterloo? G. Pallain, ed., The Correspondence of Prince Talleyrand and King Louis XVIII During the Congress of Vienna (New York, 1881), p. 154. Alexis Henri Brialmont, History of the Life of Arthur, Duke of Wellington, translated and edited by G.R. Glieg, Vol. II (London, 1858), p. 509. Robert Stewart Castlereagh, Correspondence, Despatches, and Other Papers of Viscount Castlereagh, edited by Charles William Vane, Vol. II (London, 1853), p. 420. Supplementary Despatches, Correspondence, and Memoranda of Field Marshal Arthur Duke of Wellington, Vol. 12 (London, 1865), p. 430. Earl Philip Henry Stanhope, Notes of Conversations with the Duke of Wellington, 1831-1851 (London, 1889), p. 36. Notes of Conversations with the Duke of Wellington, p. 94; and Charles C. F. Greville, The Greville Memoirs: A Journal of the Reigns of King George IV and King William IV, edited by Henry Reeve, Vol. II, (London, 1874), p. 305. Notes of Conversations with the Duke of Wellington, p. 32. I’m guessing the conversation on the relative merits of Charles X and Louis XVIII took place after the Revolution of 1830, although that’s not clear from the source. Despite King Louis’ unpleasantness, he must be reckoned the better monarch, by far. It’s hard for a somewhat Bonapartistic person like myself to admit, but he turned out to be, on the whole, a good king. Charles is one of these monarchs for whom it might have well been written that he would have been thought of as someone who would have made a great king, had he never reigned. His deposition in 1830 was rank stupidity, and if the man had only possessed a little sense, need never have occurred. Yes, Wellington made those remarks after the 1830 French Revolution, Hale. I completely agree with your comments regarding Louis XVIII and Charles X.
Louis the Eighteenth was a walking sore – a perfect walking sore – not a part of his body was sound – even his head let out a sort of humour.